The Friends of Riverside Park, a 501(c)3 nonprofit organization, was established in 2006 to revitalize and promote Janesville’s historic and scenic Riverside Park. In the past decade, the Friends of Riverside Park has donated over 10,227 hours and $65,000 and counting, toward park improvements. 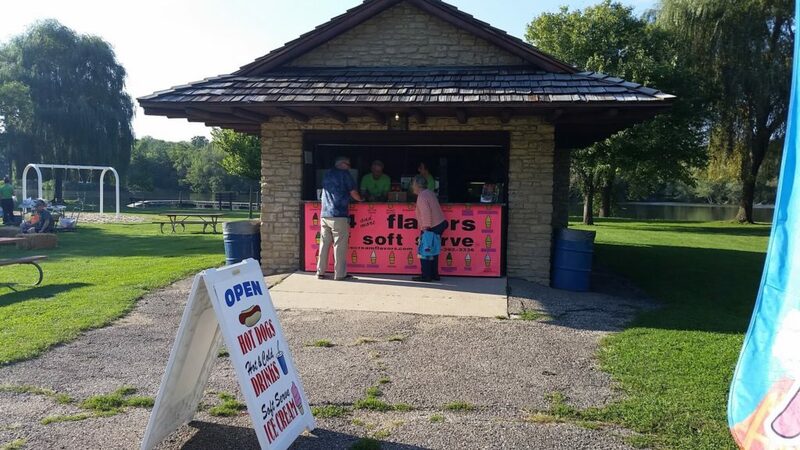 During the summer months, we operate a concession stand (open Friday-Sunday) in the park’s northern section, as pictured above. Revenue from the concession stand goes directly to support our various projects and improvements throughout the park. To revitalize, preserve and promote Janesville’s historic Riverside Park. The Friends of Riverside Park’s goals are to revitalize the park through infrastructure improvements while preserving and promoting the historic value natural beauty; enabling it to once again be used to its full potential. We have many different volunteer opportunities to match your skill and interest. These areas include landscaping, research, membership, and fundraising. Need a place for your group to volunteer? We schedule work days throughout the year.